When I need time to just ponder over life, when time seems to pass by in a flash (specially when you have a 1 year old), when I really just want to stop, breath and slow down, I cook my mom's haleem. 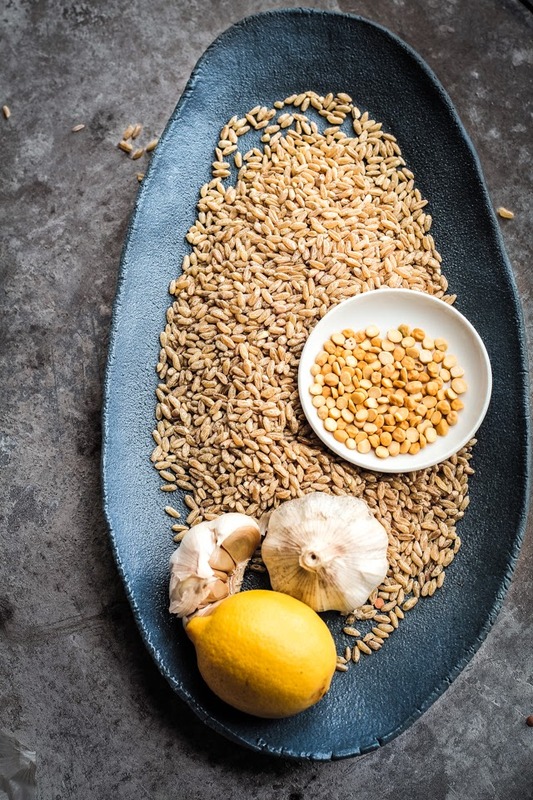 The constant swirl movement of the ladle eases away my anxiety, lost in the hypnotic rhythm of stirring, the earthy wheat and lentils warm you up even before being consumed. That is the beauty of comfort foood. This humble looking dish is made in many countries and have deep roots in the Arab world where it is believed to have originated (called harissa) and then spread to South Asia through colonisation. Muslims in India and the subcontinent usually make it during the the fasting month of Ramadan or the mourning month of Moharram as per Muslim Hijri calendar, as it is makes for a highly nourishing, fibre and protein rich meal. 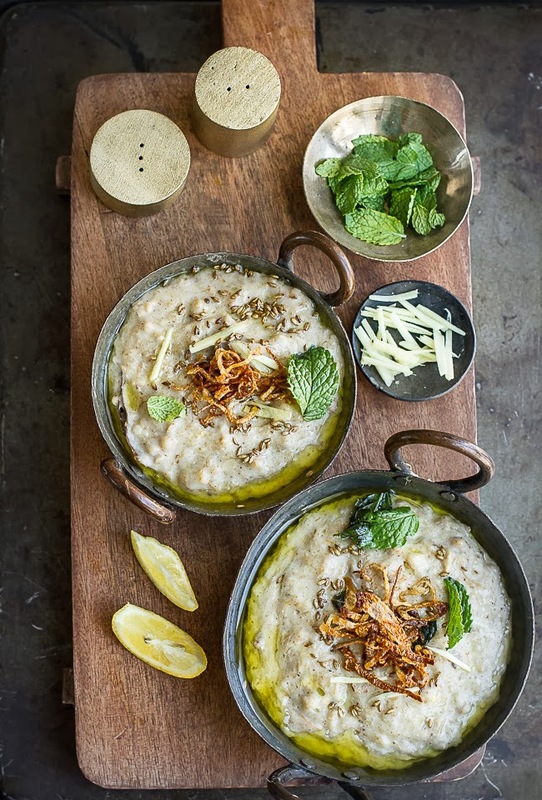 Bohras use the word haleem and khichra interchangeably and make a subtly spiced version compared to the spicier Hyderabadi haleem. It is a perfect, soul warming, hearty winter dish. Cooked for a long time, the meat not only falls off the the bone, it mostly dissolves into the lentils and wheat. The result is a sticky rich and luscious porridge. It only gets better as it sits for a day or two, or perhaps it is my way of lingering on comfort for longer. More involved a recipe than my usual preference these days but it is totally worth it. Pick up a weekend to make it, so that you can enjoy it for breakfast or lunch during the weekdays. If not eaten immediately and stored in the fridge, it will thicken up. Use water or milk to loosen it while heating. Also, don't skip on any of the garnish, it is incomplete without it. After 1 1/2 hr, the wheat should have completely softened and the meat should fall of the bone. Remove the lid, keep cooking the mixture by continuously mashing the mixture for another half an hour and add milk as you do so. This creates the sticky lustrous quality that khichda is known for. It is important the the wheat completely disintegrates into the creamy mixture. Alternatively, you can separate the meat, the grind the mixture in a processor and add back the meat later. Finally, heat the ghee till smoking and add the cumin seeds. Drizzle the ghee on the khichda while serving. Serve hot with naan, tandoori roti or any flatbread. Wholesome and scrumptious! An interesting porridge. haleem is one of my favorite things to make although I make it with chicken..making a comfort food is really therapeutic. This is such an interesting recipe! And also curious that it is called Khichda. Indians make kichidi with rice and lentils minus the meat. At my house, from the south, we call it Pongal and its an absolute comfort food, just like your recipe. I am going to make this one of the weekends! Sounds perfect for the cold weather here! Khichdi is like the sister of khichda! While khichdi is mostly a mix of rice, lentils and whatever is leftover, khichda is with wheat and lentils. I think the words might have similar roots. You couldn't have missed this in Kolkata during Ramadan in Muslim colonies! This looks beautiful! Every tried the thinner, spicier Mauritian halim? No I haven't but you sure got me curious to try it! What a beautiful post! Perfect dish for cooler weather. You know K, I never dared to eat haleem because I am not too sure of dal and meat together - you know mushy gooey types. Few of my muslim friends talked lengths about this speciality in old delhi areas. However, with that list of ingredients, I think its gonna be quite aromatic & comforting. This perhaps is the most genuine recipe I have found till now, thanks n cheers! This perhaps is the most authentic recipe I have found, till now. Thanks n cheers!